With increasing population and its associated demand on our limited resources, we need to rethink our current strategies for construction of multifamily buildings in urban areas. Reinventing an Urban Vernacular addresses these new demands for smaller and more efficient housing units adapted to local climate. In order to find solutions and to promote better urban communities with an overall environmentally responsible lifestyle, this book examines a wide variety of vernacular building precedents, as they relate to the unique characteristics and demands of six distinctly different regions of the United States. Terry Moor addresses the unique landscape, climate, physical, and social development by analyzing vernacular precedents, and proposing new suggestions for modern needs and expectations. 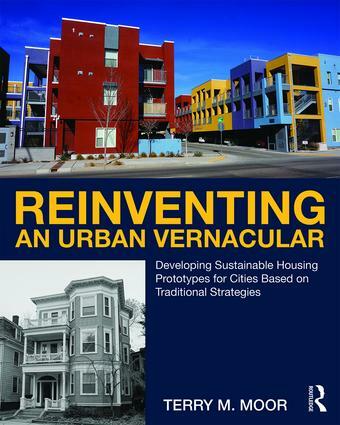 Written for students and architects, planners, and urban designers, Reinventing an Urban Vernacular marries the urban vernacular with ongoing sustainability efforts to produce a unique solution to the housing needs of the changing urban environment.